Philly FileMaker Meeting Tonight 4/24/2014 this summer, so if you want a taste of what DevCon presentations are like, drop on by! In any database solution, the preservation of data integrity is the primary goal of every developer. With the FileMaker platform, there are many “out of the box” features that provide the required data validation and verification. This presentation takes the next step as we will examine a number of techniques that allow developers to guide the user through the solution in the layout layer and help preserve data integrity by showing the user only the needed fields for the task at hand. There are a number of layout objects and simple scripts that give developers a way to present choices to ensure that the correct business processes are followed for the given solution. With the December 2013 release of FileMaker 13, the presentation with spotlight a few of the new features of FileMaker 13 that can be used when guiding the user through a solution. Todd Weller is the Senior Data Systems Architect with Cross IT Services and Solutions, LLC. He has been using and developing FileMaker databases for over 12 years for both in-house and outside client solutions, starting with FileMaker 6, and is a FileMaker 12 Certified Developer. He holds an electrical engineering degree from Grove City College. Prior to his FileMaker experience, he worked in industry for an electrical engineering firm that specialized in systems integration as a PLC and Drive System programmer and troubleshooter." The Philadelphia FileMaker User Group was founded in 2004 as an initiative by FileMaker Business Alliance Platinum member IT Solutions Consulting. The group’s goal is to provide an open forum for FileMaker developers and those interested in FileMaker to meet, brainstorm and network. We hold meetings the 4th Thursday of every month at 6PM, in the office of IT Solutions Consulting, Inc., at 414 Commerce Drive, Suite 150, Fort Washington PA. Meetings are open to all, regardless of background and there’s no charge to attend. Please RSVP here if you are planning to attend this meeting. As always, pizza will be provided after the presentation, around 7:15 PM, along with post-presentation socializing and discussion. 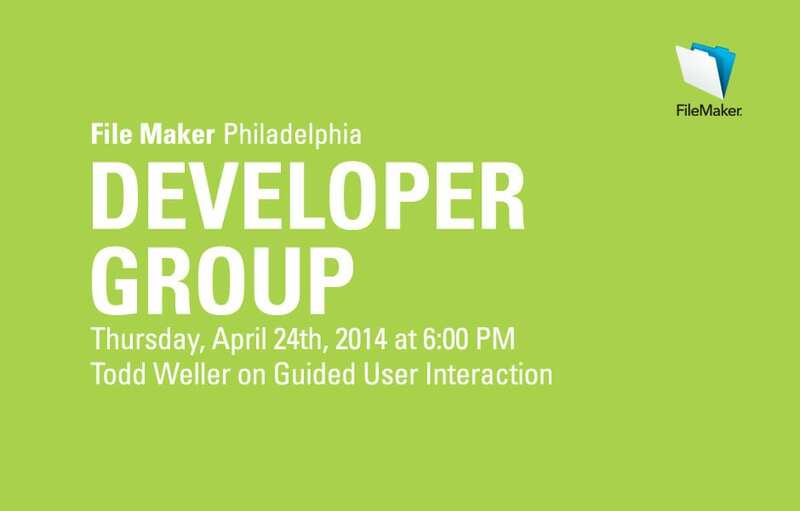 Our next Philadelphia FileMaker Developer Group meeting has been scheduled for Thursday evening, April 24th, 2014 at 6:00 PM. The meeting will be held at the IT Solutions office in Fort Washington. We’re pleased to have Todd Weller presenting on Guided User Interaction – Todd will be presenting this same topic at FileMaker DevCon this summer, so if you want a taste of what DevCon presentations are like, drop on by!